13 x 13 Amazing Spiderman bouncer, this is the officially licensed unit that looks exactly like the movies, not a knock off. 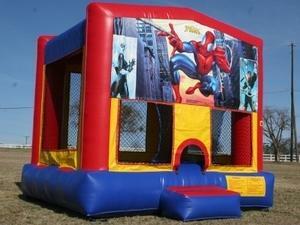 Your little superhero will be welcomed at the safety entrance to the bounce house by none other than the Amazing Spiderman where they can jump and bounce all day in a clean top of the line jumper. This one is a big hit with all of our customers in Lakeland as well as Winter Haven and all other Polk County Florida locations. This one rents fast, so get it while you can and give your little one Spiderman!